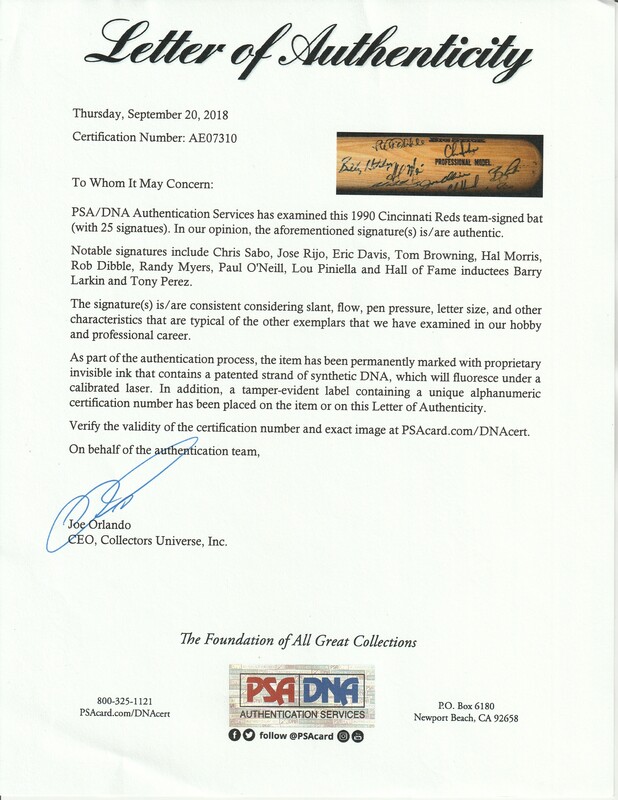 Presented here is a Rawlings Adirondack Big Stick Professional Model bat signed by 25 members of the 1990 World Series champion Cincinnati Reds. The Reds swept the defending World Series champion Oakland Athletics to claim the 1990 Fall Classic crown, their first title since the days of the Big Red Machine. Signatures on this bat include the Hall of Famers Barry Larkin and Tony Perez, as well as Paul O’Neill, Lou Piniella, Jack Armstrong, Todd Benzinger, Tom Browning, Tim Birtsas, Norm Charlton, Eric Davis, Rob Dibble, Chris Hammond, Billy Hatcher, Danny Jackson, Tim Layana, Hal Morris, Ron Oester, Joe Oliver, Luis Quinones, Jeff Reed, Jose Rijo, Chris Sabo, Glenn Sutko, and Herm Winningham. The signatures have been written in blue marker. This bat comes with a LOA from PSA/DNA (AE07310).